Days after new corps officers arrived in Hayward, California, the advisory council made sure introductions took place—conveniently, all at once. When Captains Carlos and Leilani Armendáriz arrived this summer at their new appointment as Corps Officers in Hayward, California—their fourth appointment in the Western Territory—they knew they needed to get to know the community. They didn’t know the introductions would happen days later and all at once. The corps’ Advisory Council parked the canteen at a community summer street fair to serve beverages and say hi to their neighbors—some 159,000 people who live in the 64 sq. mi. East Bay city. In his 27 years pastoring in Hayward, Horner said he’s noticed that by the time corps officers get settled in the community, it’s usually time for another appointment. He wanted the Armendárizes to be able to hit the ground running. “I consider myself a net weaver, not a networker,” Horner said. Armendáriz agreed it often takes time to set up and conduct introductory meetings with leaders in the community in a new appointment. But things were different this time. 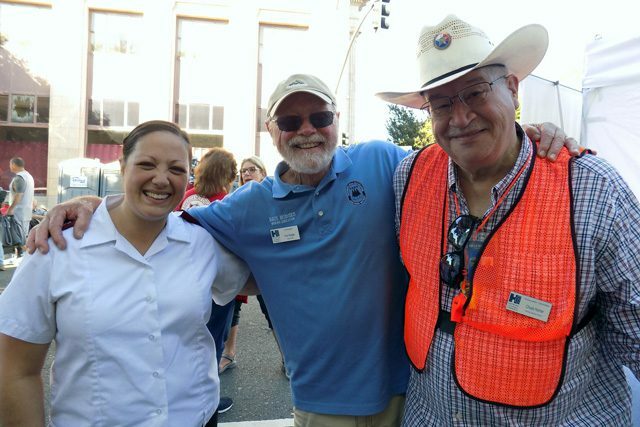 Captain Leilani Armendáriz with Hayward Corps Advisory Council members Paul Hodges, Jr., and Chuck Horner at a Hayward, California, downtown summer street fair. The advisory council in Hayward comprises 13 volunteers from the community who organize to strengthen The Salvation Army’s ability to serve and perform its functions as an ancillary to the Alameda County Advisory Board. It plans, advises, raises funds and provides other practical assistance to the officers and employees responsible for the operation of The Salvation Army in Hayward. Armendáriz said it’s a voluntary group like none other she’s worked with. Half of its members also serve on the corps’ Emergency Disaster Services team and deployed recently with Carlos Armendáriz to the Carr Fire. Another member is handling all planning for this year’s Red Kettle Kickoff. “Everyone is extremely active, and the more they do to help us, the more we can be available in the community,” Armendáriz said. One of those early introductions led to further conversation with a city council member and allowed Armendáriz to offer the resources of The Salvation Army. This month, the corps is also opening an after-school drop in center for area kids to come and do homework in a computer lab.